Hello bloggy friends and welcome to Nonna's Craft Corner! 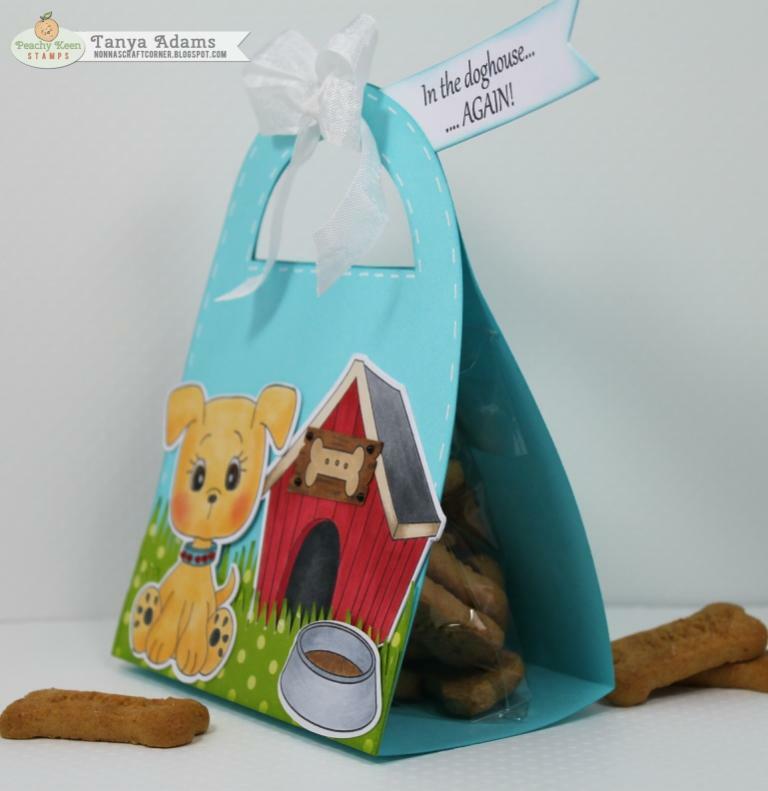 * I made a little treat bag using the "K Cup Treat" cutting files from Pretty Paper, Pretty Ribbons. Using my white gel pen, I added a few stitching lines around the bag. * Next I created some grass using a MS punch and some pretty green polka dot paper. 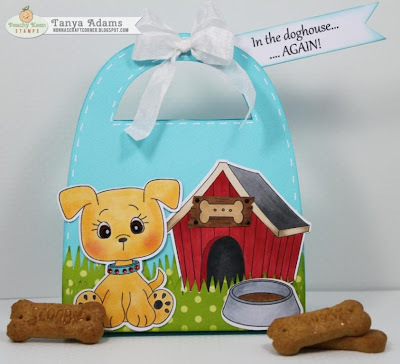 * All of the sweet images on this project are from the August Stamp Club from Peachy Keen Stamps. * All of the images are colored with my Copic markers. I added a few gems to the dog collar and some Glossy Accents to the cute little pup's eyes. * I created a sign for the doghouse using a sign file from the Silhouette Online Store and the cute little dog treat image from the stamp set. * I searched several stores before finally finding the "Scooby Snacks" cookies that I just had to have for this fun treat bag! I added a few to a cellophane bag, stapled it and used my ATG to adhere it to the inside of my treat bag. * I added a Hook & Tab fastener to the inside at the top of my bag so that it can be opened and re-closed again and again. * A bit of white Crinkle ribbon and that cute sentiment finished up this project perfectly! I hope you enjoyed my fun little treat bag today. If you are not familiar with the Peachy Keen Stamp Club you can read all about by clicking the link. It really is a great deal! Before I let you go, I want to remind you to stop by the Peachy Keen Stamps Blog and take a look at what the other designers have created for your inspiration. You are gonna love all the Peachy Cuteness! This is adorable!!! That puppy is sooo cute!! Wonderful treat bag!! Super job on your cute treat bag. Your Peachy Puppy is so cute. Great details...I like the stitching on the bag and pretty bow. This is such a cute project !! Love the puppy and his expression is so cute ! This is absolutely Adorable, love that little puppy. Awesome Creation my friend. OMG Tanya!! How super adorable is this!!! 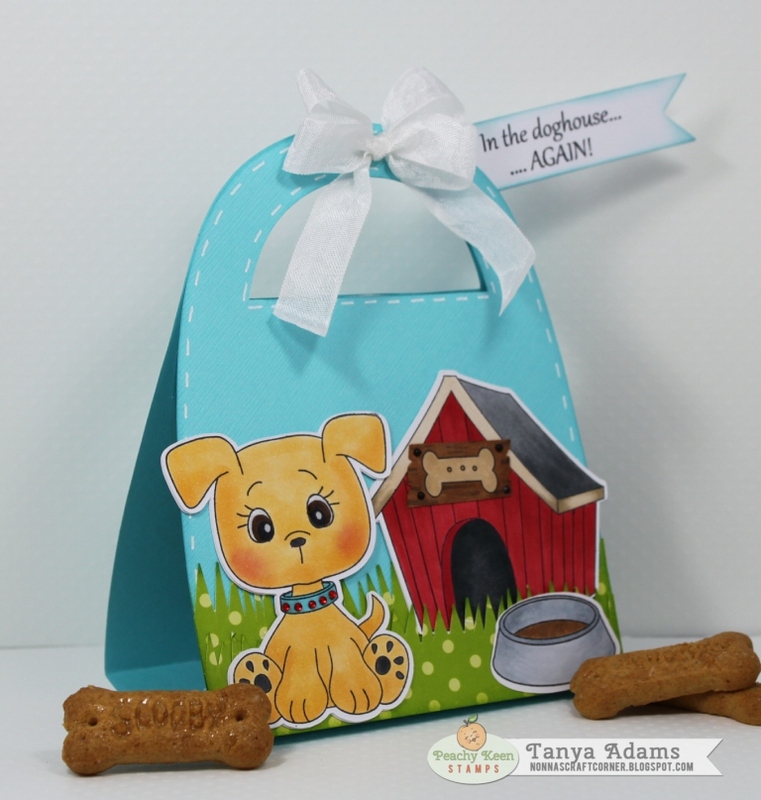 LOVE LOVE LOVE that little bag with the treats and that pup is so adorable!! Very cute treat bag. Perfect for a special puppy. Such a cute treat bag. Love the added stitching. Tanya ~ OMG! This is too CUUUTE too! OMG! Of course the coloring, the stamps and the details are AMAZING! But the colors I ADORE together! Would this be for a certain little lady in your house~ Miss Lola??? Oh I think the word "snuck" works for me too! LOL! Have a great day and hopefully will be there tonight for the release! The image is ADORABLE!! A TOTALLY cute treat! Love it my friend! !